see no evil in all directions..."
Aussie rockers INXS had an immensely successful career, after really coming into prominence with the single Don't Change in the early MTV days way back in 1982, and building momentum with the 1984 album The Swing on through their breakthrough Kick release in 1987. The band continued to thrive well into the 1990s, and met with a major setback and tragedy when lead vocalist Michael Hutchence committed suicide in November of 1997. 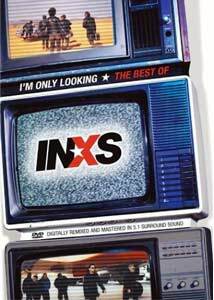 INXS: I'm Only Looking, a smart two-disc set from Rhino, is about as complete of a retrospective as I've ever seen for a band, and if you're a fan, this will probably be a real treat. Disc 1 (01h:55m:41s) houses all 26 of their music videos, each with a brief intro from remaining band members Tim Farriss, Jon Farriss, Andrew Farriss, Kirk Pengilly, and Garry Beers. The videos are presented chronologically, from Just Keep Walking (September 1980) on through what was ultimately their swan song, the ironically titled Elegantly Wasted (January 1997). Of course the none-too-subtle innuendo of The One Thing, featuring the band at a long dinner table where food is overtly sexual, is included here, and it still makes me scratch my head wondering how that thing ever got aired on a regular basis. A good number of the clips are directed by long-time collaborator Richard Lowenstein, but a few are helmed by such luminaries as Godley & Creme (This Time), Alex Proyas (Kiss the Dirt) and Joel Schumacher (Devil Inside). Even if the subject matter of a particular video ventured into offbeat territory—the anorexia/bulimia visuals of Beautiful Girl or the pre-teen voyeurism of Taste It—most seemed geared to showcase the pretty boy rock star looks of Hutchence, who used his own brand of pouty dance moves to really help the videos sell the music. As a plus, the second disc (see below for more details) contains overs 2-1/2 hours of INXS extras, including ten live performances that run about 55 minutes, finalized by a very cool montage of Don't Change using assembled live footage from various points in the band's career from 1983 through 1997. It comes as something of a relief to see how well the band plays live, proving (as if they needed to prove it to anyone) that they weren't just a "video" band. Hutchence, with his swaying and preening, had his own distinct set of rock star moves—and when combined with musical muscle of the Farriss brother, Garry Beers and Kirk Pengilly—had the ability to turn a jam-packed crowd at Wembley Stadium in 1991 into one large undulating mass of arms and heads as witnessed during the clip showcasing a performance of New Sensations. With forward progress pretty much put at a standstill with the death of Hutchence, there have been recent rumors that the band will take part in a reality series to find a new lead vocalist. That whole thing has a bad feel to it, and I'd rather just wallow in the past, and thanks to this retrospective I can. Image Transfer Review: All the material on this two-disc set is presented in 1.33:1. Quality is an inconsistent crapshoot, and though most of the content looks tolerable, the disparity between the band's early videos and their later, more lavish productions, is evident in the lushness and film-like appearance of some of these more recent clips. The live footage has a bit more grain, and is noticeably less polished. With material spanning nearly twenty years, it isn't really much of shock that the quality varies quite a bit. It certainly isn't bad, it's just average. Audio Transfer Review: This is rock and roll on DVD, so the audio better be up to snuff. Thankfully, two extremely strong audio options are available in either 5.1 Dolby Digital or DTS. Both tracks have deep, resilient bass that becomes decidedly more pronounced during some of the band's later material. I didn't notice all that much of a difference between the two mixes, with both offering rich and full sound reproduction, whether it be live or video. A red-headed stepchild of a PCM stereo track is also included. Extras Review: Rhino has done an outstanding job on gathering up not just the video and live footage, but the extras; they are not random bits thrown together to fill out a disc. All of the extra stuff is found Disc 2, which also contains the 10 live performances (Simple Simon, Original Sin, Listen Like Thieves, Kick, New Sensation, Need You Tonight, Mediate, Searching, Elegantly Wasted, Don't Change) that I touched on in the main body of the review. Welcome to Wherever You Are (18m:00s) is a mini-doc that briefly chronicles the events leading up to a huge 1992 open-air concert the band put on in Sydney, and in it we get to see rehearsals, as well as performances of Heaven Sent and Taste It. Behind the Scenes (18m:00s) is yet another mini-doc, with comments from former manager Chris Murphy and video directors Richard Lowenstein and Troy Davies, all discussing the impact the band's video had on all involved. Pictures from a Full Moon is four excerpts from an INXS "video album" entitled Full Moon, Dirty Hearts helmed by long-time INXS video director Richard Lowenstein. The songs Time, Make Your Peace, I'm Only Looking and Please are represented by videos made by students and filmmakers, all overseen by Lowenstein. Rare and Unreleased highlights four videos and live performances that were not commercially released, in this case The One Thing, The Strangest Party, Everything, Searching and Don't Lose Your Head. Things wrap up with an automated Photo Gallery of studio shots, location photos and private collections, taken by such high-brow names as Herb Ritz, Lynn Goldsmith, Annie Leibowitz and Helmut Newton. Man, that's a lot of INXS, covering just about every corner of their career. Attention INXS fans: this is the one thing you need. OK, excuse the paraphrasing of song titles, but this two-disc set does have all the videos, a batch of live performances, special remixes, interviews. You name it. It's here. And with 5.1 and DTS surround, no less.